We woke up just before dawn on Thursday morning, the day we had planned to do our first peak hike of our vacation. It was a brisk morning, but we didn’t have any trouble getting out of our tent after sleeping on uncomfortable ground. Our internal clocks were still an hour ahead of Mountain time — a huge perk to driving West. We packed up the tent and pulled out our camp stove to heat up a can of beans. 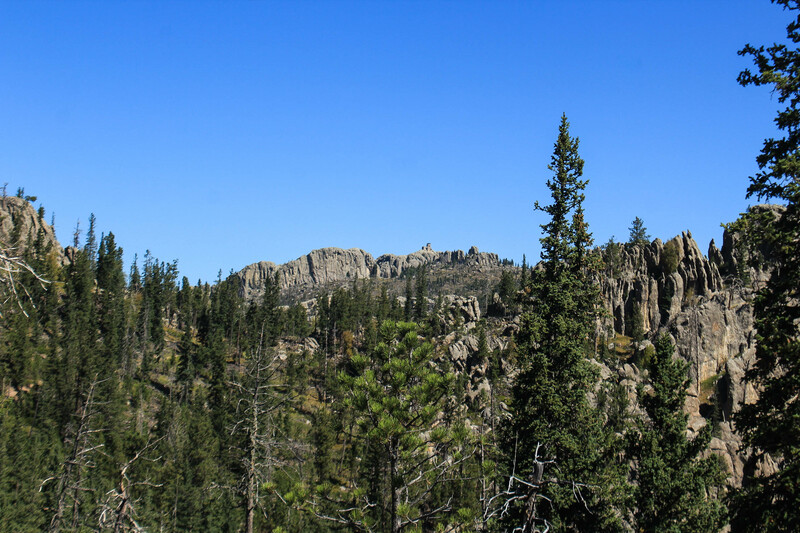 We reentered Custer State Park and drove through the Needles Highway, awestruck by the beauty of the rock formations in the bright morning sunshine. We didn’t stop at all along the way because we wanted to get an early start on our hike, and we knew we’d be getting views like these along the trail. Driving the road so early in the morning was a good idea though, there was hardly any traffic so it was easier to get around all the narrow curves and through the one-lane tunnels. We arrived at the trailhead after a 20 minute scenic drive, finding only 3 other cars in the large parking lot. We refilled our various water containers and began our hike — it was around 7:30, chilly and bright. 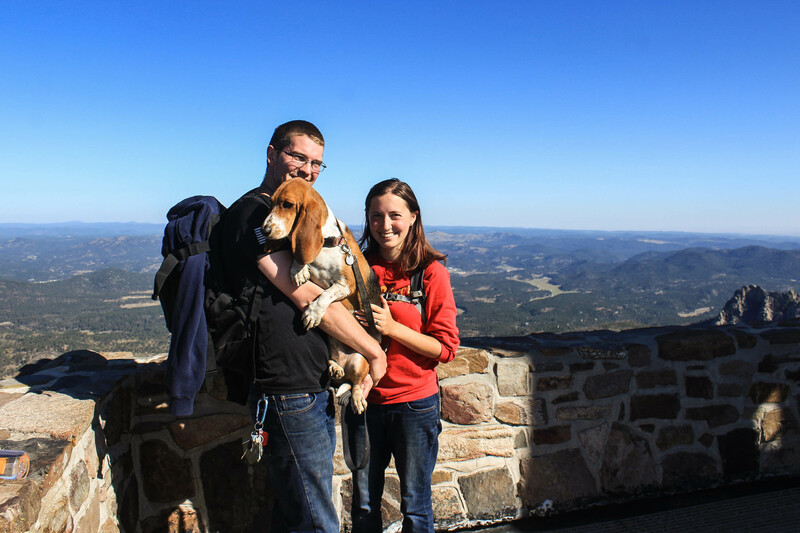 When I hiked this peak in 2015 with my family, it was called Harney’s Peak, but in the past couple years the name has been changed to Black Elk Peak. Not all of the signs have been changed, and we heard people calling it both names. The trail was just as I remembered it though, with a few more benches placed along the way. We made great time getting up to the peak, and were glad we had started so early — it was a bright and cloudless day, and we knew it would only get hotter as the morning wore on. We took the most popular trail and made it the 3.5 miles to the peak shortly after 9. I remembered that the hardest part last time was all the steps leading up to the tower at the top, and Curtis agreed with me as we were climbing them. Charlotte was not a fan of the metal grated staircase where she could see the ground far beneath, and cried like a baby when we had to descend them. 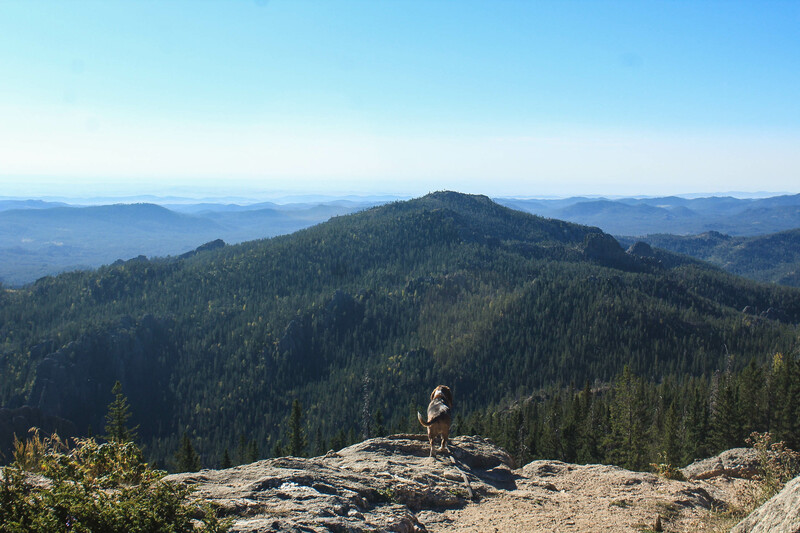 We were the third ones up to the peak that morning, and we enjoyed the clear views of the Black Hills and beyond, and snacked on peanut butter and nutella sandwiches. We celebrated Curtis finally catching up to me with high points — this was now our 12th together! Also, we couldn’t believe that here at 7244 feet above sea level, we were at the highest elevation that we had hiked since November of 2015! We exited the tower to begin our descent, and found a large group of people had just arrived — perfect timing for us! 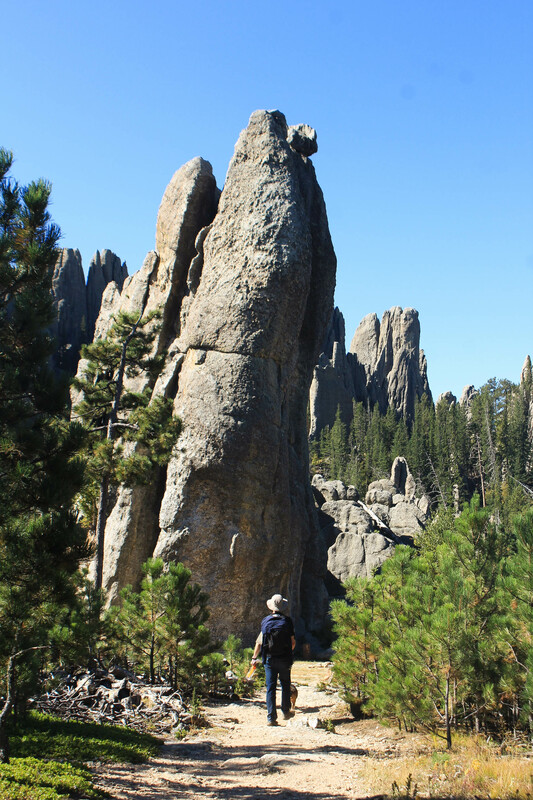 Instead of returning the way we came, we decided to take a slightly longer trail back that would take us around the Cathedral Spires and Little Devil’s Tower. We had consulted the map at the trailhead and had planned our route carefully to know which numbers to follow back to our car — basically just making sure to follow signs back to Sylvan Lake, which is in the same parking lot as the main trail to Black Elk Peak. The trail descended down the East side of the peak, and there wasn’t much of a tree cover so we were in the sunlight for much of the remainder of the hike. We found a letterbox planted by some friends, and saw a buck nearby with huge antlers. We decided to take the spur trail to visit Little Devil’s Tower, but it turned out to have a rather narrow and steep rock scramble towards the end so I let Curtis go the rest of the way while I waited with Charlotte in the shade. She used to climb up those with no problems, but after one incident where she couldn’t make it up one this past summer, her confidence seems to be shaken. Besides that, it was starting to get hot and she was growing tired. We allowed her to stop more often and gave her as much water as she would accept. 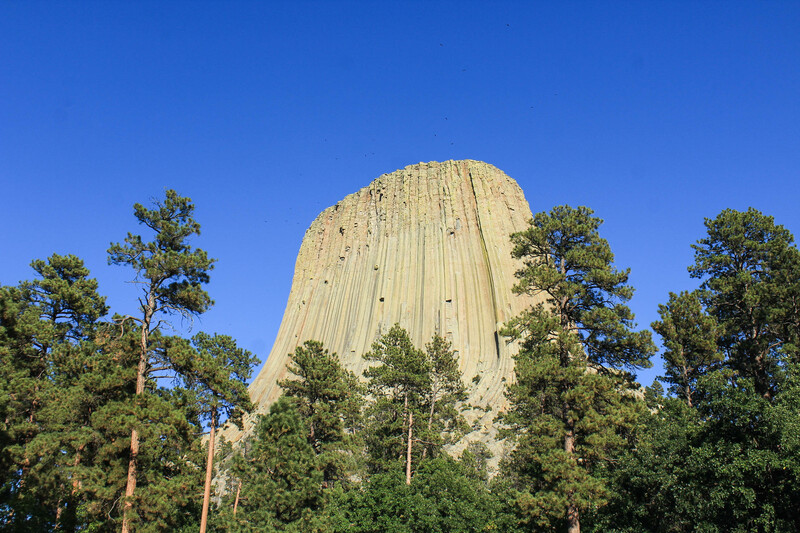 Curtis said the view from Little Devil’s Tower was worth it, as it is a prominent peak that gives a great view of the area, including Black Elk Peak. The benefits to taking this trail back are that it is less popular than the main trail, which regularly sees at least 200 hikers a day in its peak season, and having new views to enjoy. Doing this trail and adding the spur to Little Devil’s Tower added maybe a mile more. We made good time however, at least until the end. There, we mistook a side path for the main trail back to the car and ended up climbing up a steep slope during the heat of the day. We realized our mistake and took the right trail down to a parking lot further south from the lake. Curtis went to get the car while I waited with Charlotte in the shade again. 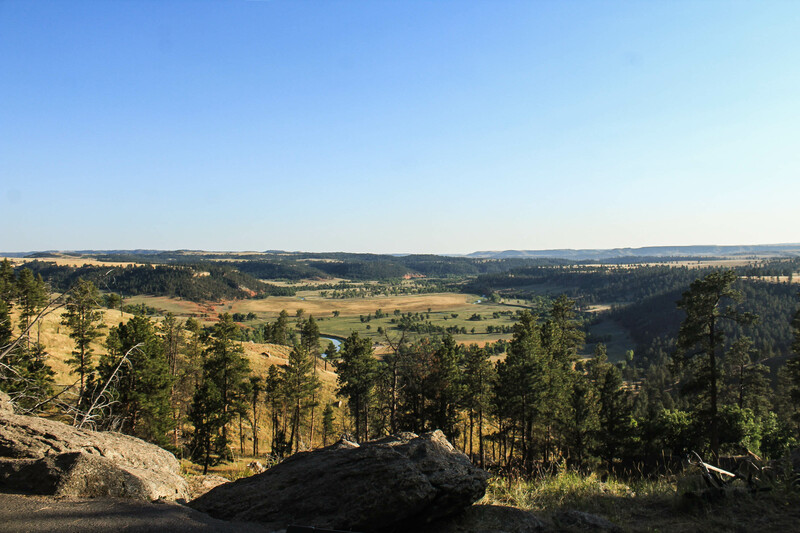 At this point, it was around noon and getting rather hot, so we decided to just enjoy the scenic drive through Spearfish Canyon and make our way to Devil’s Tower National Monument where we were considering camping. Spearfish Canyon was a beautiful drive, but not as lush and green as I remembered it. After a long and dry summer, the waterfalls we passed were barely a trickle. (Check out this post to see what they looked like 2 years ago in July — we didn’t even stop for them today.) When we made it to Spearfish, SD, we stopped to pick up some food for dinner and consulted the map for our route to Wyoming. 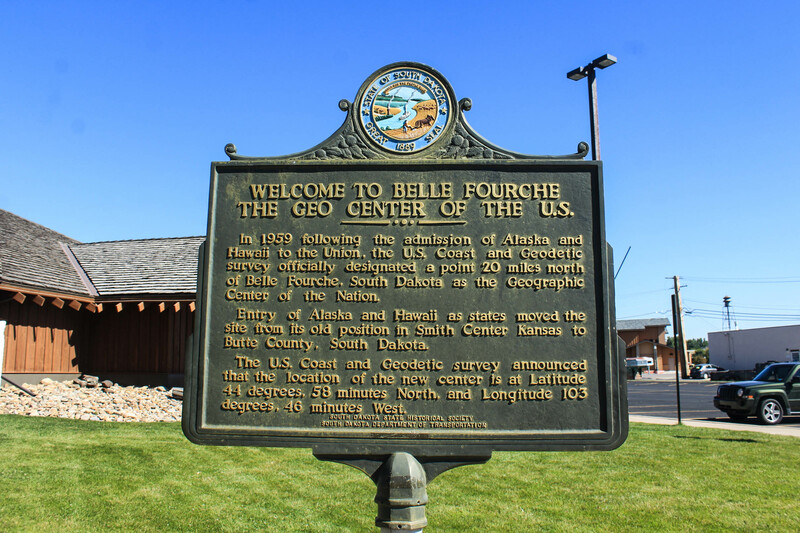 While doing so, we noticed that just North of us in Belle Fourche was the Center of the Nation Monument. How could we resist such a place? We opted for highway roads rather than the interstate so that we could stop here on our way. Plus, new counties (for Curtis at least). Once we arrived, however, Curtis went into the museum and while I was walking Charlotte around, I read the sign and noted that this wasn’t actually the center of the nation…it clearly says on the sign that this is 20 miles South of the actual point, which is in the middle of a field off a dirt road. I didn’t even care to get a picture of the monument here — why should we care if it wasn’t the real thing?? We started discussing alternate plans. However, we really wanted to stop and see Devil’s Tower since Curtis hadn’t been there before, and we needed a place to camp. We decided to carry on with our plans for the night and once we had a place to stay, we would map out our route for the next day. We drove into Wyoming and made our way to the tower. Last time I visited, we came from the interstate, so neither of us had any idea when we would finally see the tower. With every turn or slight hill, we waited with great anticipation to see if it would be visible on the other side. We finally came over a hill and there it was, its tall silhouette standing high above the ground below. It is truly an incredible sight. We also had a great view of the Missouri Buttes to its side. We made it to the park, which was quite crowded, and I let Curtis do the mile long loop hike that goes around the base of the tower while I stayed with Charlotte, who wasn’t allowed on any trails and was too tired to care. I have to say, while last time I remember visiting and feeling no desire to climb this tower whatsoever, today I was much more interested in the idea. Once Curtis was finished, we went back to the campsite to pick out a spot. However, we found the entire site to be filled with RV’s and were less than enthused about the idea. We found one vacant spot where we parked and filled out the camping slip…but the longer we sat there, the less we wanted to be here. We remembered seeing two other signs for campsites in the national forest on the drive here, and decided to shoot for one of those instead, hoping that it’d be quieter and less expensive. We do love national parks and monuments, but rarely do we ever go camping in them. They’re always much too crowded for our liking. We were able to find a spot in a Black Hills National Forest campsite in Wyoming that was a short drive from the highway, smaller and much quieter. We set up our tent, ate dinner and discussed what we wanted to do next. Up until this point, our route had been set based on the places I had been before that we wanted to visit together, but now we actually had to decide between two very different road trips we could possibly take. We could go West, across Wyoming, into Idaho and make our way Northwest to Seattle, or we could backtrack slightly and head North into North Dakota, then drive across Montana and Idaho’s panhandle. We had no reservations for the next 6 days, just a list of all the things we could possibly do on either route. The decision would have been near impossible for us to make had it not been for one huge factor: wildfires. I had been tracking the fire activity out West for at least a month prior, knowing that it could affect our trip, and sadly it seemed as though things weren’t improving. It wasn’t just the fires we were concerned about, we knew that smoke and air quality was another thing we had to look out for while hiking in these areas. It was because of this that we decided we would head North, because we knew of a hike we could do in North Dakota that had no nearby fire activity, and then we would find the safest way to get through Montana and hopefully be able to do more exploring in Idaho’s panhandle and Western Washington. With that decision made, we went to sleep with plans to wake up and get moving as early as possible the next morning.